George is articulate, passionate about humanity and community, funny, a role model for what it means to be active in your community and for fighting for the oppressed and the forgotten. He sees an injustice and he fights it. I admire him. George’s legacy was never about Star Trek — it’s about fighting for dignity and equality. 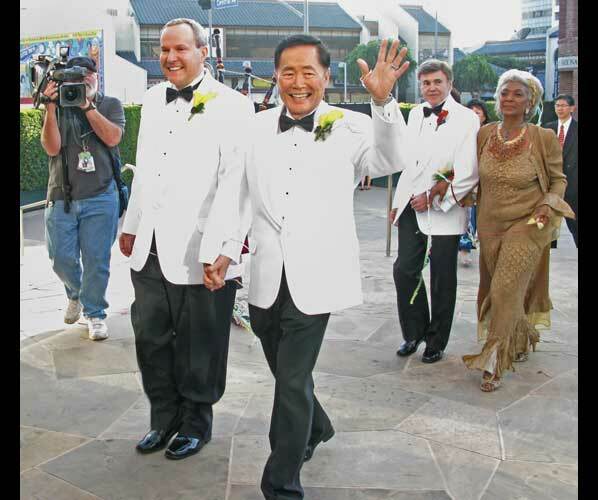 He has fought for equality for Japanese-Americans and the rights of others for years, and now fights for equality for gays. Star Trek’s Deforest Kelley used to speak about how many letters he received from kids who had entered medical school because of his character of Dr. McCoy. In much the same manner, I believe George and Brad’s high profile and very public, loving wedding will encourage many gay people that they can be public about their love, and have the relationship (and wedding) they want. I certainly hope so. What a beautiful sentiment. I could not agree more. No matter what their orientation, two unattached adults in a consensual, loving relationship — that’s never wrong. It makes me so happy that George and Brad can, in George’s words, “Dignify” their 21 year relationship. God bless George and Brad for helping pave the way for so many others! Happiness always!